Welcome to that other Italian motorcycle manufacturer. 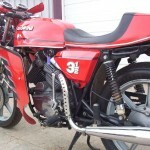 Sure, you’ve heard about Ducati, know about Bimota, just read about Laverda, and now we’re throwing a Moto Morini your way. If you are a regular reader on RSBFS, though, you will note the similarities to this post here. 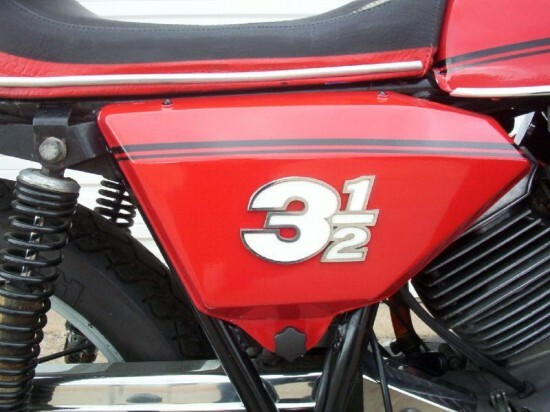 Based around a 72 degree air cooled vee twin designed in the early Seventies, the base 3 1/2 produced approximately 35 horsepower at 8,500 RPM. 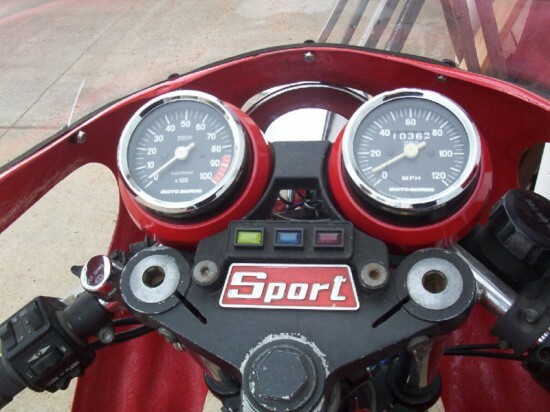 This model, a 3 1/2 Sport, benefited from some additional chassis bits (clip on bars, Veglia instrumentation, and a steering damper) along with a bump in compression. The Sport engine was good for 38 horsepower at 8,500 RPM. 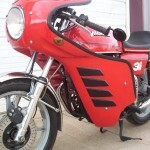 HERE IS MY 1978 MOTO MORINI SPORT, VIN NUMBER 14738, A REAL SPORT WITH THE “S” ON THE ENGINE. I HAVE OWNED THIS BIKE FOR ABOUT 5 YEARS, STARTED IT SEVERAL TIMES AND FINALLY ACTUALLY RODE IT TODAY!! – JUST TO SAY I HAD BEFORE PUTTING IT UP FOR SALE! A VERY RARE AND COOL BIKE! I AM SELLING IT TO GET CASH FOR A BIKE TOUR TO ALASKA THIS SUMMER. I HAVE ENJOYED HAVING IT AROUND AND LOOKING AT IT LONG ENOUGH-IT IS YOUR TURN NOW. VERY, VERY NICE OLD BIKE AND ONE OF THE BEST HEAD TURNERS I HAVE EVER HAD!! 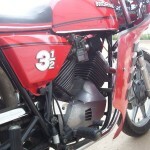 YOU MAY SEE A FEW OLD DUCATIS, LAVERTAS, MOTO GUZZIS, PASS YOU ON THE ROAD-BUT NOT ONE OF THESE! 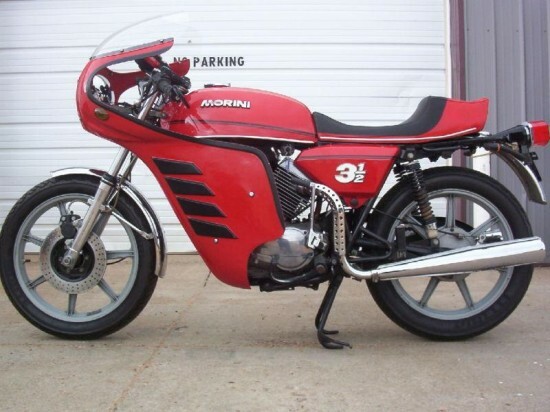 THIS IS A NICE, RARE BIKE AND YOU DO NOT SEE THEM WITH THE RACING FAIRING ON ‘EM. 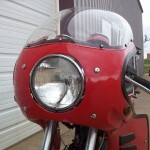 I FOUND THE FAIRING ON EBAY WITH THE CORRECT MORINI MOUNTS A COUPLE YEARS AGO AND MOUNTED IT THIS WINTER. YOU WILL NOT BE DISAPPOINTED IN THIS MOTORCYCLE!! 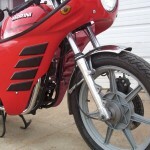 These little Moto Morini motorcycles are reported to have sharp, responsive handling. 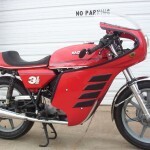 In the day, they were offered with some pretty top shelf componentry, and were priced on par with much larger bikes such as the Honda CB750. Obviously straight line performance is of no comparison to the bigger bikes, but the 3 1/2 could run circles around the Honda on tight, twisty roads. As far as price goes, there is not a tremendous amount of data to go on. The bike in the RSBFS post mentioned above was bid up to nearly $4,800 without meeting the reserve. This bike is currently at $2,800, with the reserve still in place. Expect to pay between $5,000 and $6,500 for a clean, low mileage 3 1/2. For that kind of money, you get a good looking, sweet handling bike that is very unique. Not bad return on your hard earned collector dollar!
. Good luck, and tell ’em you saw it on CSBFS!